China Pumps Up Its Currency, But To What End? China’s most recent manufacturing data showed recovery spluttering with exports soft, yet the yuan follows that by hitting a 19-year high agains the dollar. More intriguingly, the People’s Bank of China has let the currency rise within the allowable limits of its daily trading band; the yuan can rise or fall by 1% from a daily reference rate fixed in the morning by the central bank. The yuan certainly isn’t off the leash, but the central bank is giving it more latitude of late than it has in the past. The currency has gained five times as as much so far this year as it did in all 2012. The question is whether this is part of the central bank’s preparations to open further China’s capital account, a next step being to widen the daily trading band of the currency. Those of that view latch onto the words of PBoC deputy governor Yi Gang who told last month’s annual meeting of the International Monetary Fund in Washington that the band would be widened “in the near future.” The previous revision was announced in April last year, when the band was doubled. Another doubling might be on the cards. If it is, it would most likely be to get the currency swiftly to an equilibrium level with the dollar as much as anything. The aim would be to discourage the present one-way bet on appreciation that currency speculators now regard the yuan to be. Policy makers are exasperated by that. They consider the yuan to be close to where it should be against the dollar (real trade weighted value might be another thing, though). Except in exceptional circumstances most freely convertible currencies aren’t so volatile on a daily basis that they bounce around in a 4% range, so there doesn’t seem much need to widen the band just to accomodate regular daily trading fluctuations. The U.S. Treasury has, as has become its custom, again declined to label China a currency manipulator. Its latest semi-annual report to Congress does say the yuan’s effective exchange rate remains “significantly undervalued” against the dollar, though it acknowledges that the Chinese currency has appreciated by 33.8% by that measure since currency reform started in 2005. It again calls for more exchange rate flexibility on Beijing’s part. All pretty much par for the course, and intended for domestic political consumption as much as anything. More weight is given to its call for stronger policy changes on Beijing’s part to embed rebalancing. The Treasury remains concerned that the lessening of the surplus on the external account isn’t “enduring”. “Without more forceful structural reforms to promote domestic consumption, there is a risk that China’s imbalances will re-emerge as the global economy recovers,” it says. There would be little disagreement from this Bystander that further exchange rate reform is a necessary if far from sufficient condition for rebalancing. In the meantime, the People’s Bank of China seems to have been intervening in the foreign exchange markets again on a large scale with activity intensifying since the fourth quarter of last year. The reversal in the slowing of foreign exchange reserve accumulation seen in the first three quarters of 2012 points to this. This may as much as anything be being driven by the weakening of the yen ever since it became clear that Shinzo Abe would become prime minister last November. Though the official line in Tokyo is that the new government and its newly installed governor of the Bank of Japan aren’t targeting exchange rates, a weaker yen is a necessary precursor for the aggressive monetary policy aimed at achieving an domestic inflation target of 2% to work. Washington says it is monitoring the yen closely. With the yuan still closely tied by its 1% band to movements in the dollar, so is Beijing. Direct trading between the Chinese and Japanese currencies starts Friday, cutting out the dollar as an intermediary. Rates will be posted in Tokyo and Shanghai, with China’s monetary authorities allowing a 3% daily trading band for the yuan against the yen (the dollar gets a mere 1% band). And so Beijing takes yet another step along the long road to the internationalization of the yuan. How long before the won joins in, a likely next step given the plans for a free trade agreement between China, Japan and South Korea? There is no particular reason for trade not involving the U.S. to be exposed to the potential volatility of the dollar. Direct currency settlement should increase yuan settlement of China’s imports and exports, as it lessens the currency risk for Japanese and South Korean buyers of goods denominated in yuan. The same idea is behind plans for an agreement between China and its fellow Brics, Brazil, Russia, India and South Africa, to make loans in their own currencies to facilitate trade. The five Brics plus Japan and South Korea account for about 30% of world GDP, compared to 45% for the U.S., the U.K. and the Eurozone. Greater use of the yuan in trade could eventually grow into full convertibility of the currency. Before then, though, there will need to be a loosening of China’s capital controls and more opening of China’s capital markets. Both represent a greater political challenge than expanding trade finance. Opponents of reform have been able to argue that China’s national interest has been well served by cross-border capital controls and the ring-fencing of the country’s financial system. Only beyond that still distant horizon lies reserve currency status. Yuan Rising: How Much Is Enough? There is a steady drumbeat coming out of Beijing: the yuan is approaching equilibrium with the U.S. dollar. Prime Minister Wen Jiabao got it going earlier this year. Scores of Chinese officials and economists have picked it up. It is starting to reverberate among economists and analysts at the foreign banks and securities houses that have enjoyed a one-way bet on the Chinese currency for years. On cue, the yuan has reversed course in recent weeks, falling to its lowest level since mid-March. The sound is more incessant than ever. Does it deafen to deceive? The numbers show that since the peg with the U.S. dollar was broken in July, 2005 the yuan has risen by 30% against its American counterpart. 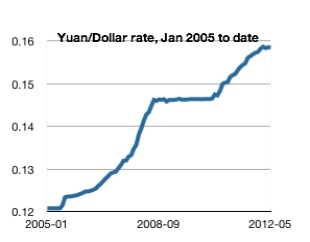 The chart to the right shows how many dollars a yuan has bought over the past eight years. Were it expressed as the yuan a dollar buys, it would show the Chinese currency appreciating from its 2005 peg price of 8.2765 to the 6.3043 it averaged in April. There was a period in the aftermath of the 2008 global financial crisis when a peg was temporarily restored. Once loosened, the yuan resumed its rise. Adjusted for inflation, and particularly the relative changes in Chinese and American labour costs, the yuan’s rise against the dollar is as much as 50% since the 2005 peg was broken. This upward revaluation of the currency has not stilled the voices in America complaining that China keeps its currency undervalued in order to support its exporters. During his recent visit for the bilateral security and economic talks, U.S. Treasury Secretary Timothy Geithner said that the currency should move higher against the greenback to allow for more flexible policy. It was a more nuanced call for a further rise in the yuan than he has voiced previously. That may reflect a better understanding on Geithner’s part than that of American trade protectionists of the reasons that China needs to let the yuan appreciate to help force the rebalancing of its economy. Yet it also recognizes the reality of the change in the exchange rate that has occurred, not popularly acknowledged in the U.S., while simultaneously giving a necessary nod to domestic political realities in a U.S. election year. Not even the most obdurate American China-basher can gainsay that the yuan is now closer to its equilibrium rate with the dollar than it was when it was pegged. Yet how much further, if at all, does it have to go? Not an easy question to answer. It takes two to make an exchange rate. Not being fully convertible, the yuan doesn’t have a free market where its equilibrium price is readily discoverable. China’s central bank determines the rate by restricting the currency to floating in a narrow margin around a fixed base rate determined in reference to a trade-weighted basket of currencies. The bank doubled the permitted daily trading band in mid-April to 1%, a small step in a long journey to fuller convertibility of the currency. It was said then that current conditions–slowing economic growth, weak export markets and investment outflows in the wake of looser currency controls–would be more likely to push the yuan down than up. So it has proved, an outcome welcome to policymakers, who can point to the market, not them, manipulating the direction of the currency in a way that happens to favor the country’s hard-hit exporters. We’ll overlook the conveniently woolly confusion of the outflow of funds on the capital account with a trade imbalance on the current account. A plateauing of the yuan’s upward revaluation may indicate that equilibrium is near, but it is not a confirmation of it. Economists commonly use two methods to estimate equilibrium exchange rates. One set uses purchasing power parity, which assumes that exchange rates will come to equilibrium at the rate that aligns prices between countries. The second approach is to look for the exchange rate that would allow for an equilibrium balance of payments. Much of the case for the yuan approaching equilibrium turns on applying the second approach. China’s current account surplus has fallen from 10% of GDP in the mid-2000s to somewhere likely to be between 2% and 3% this year. Next year it may fall to 1.5%. In macroeconomic terms, that is as near to an equilibrium balance of payments as makes no difference. Yet beating the drum for that approach doesn’t necessarily make it so. Joshua Lipman of the Wharton School of the University of Pennsylvania, in a paper published last year, calculated that the equilibrium rate using purchasing power parities was around 4 yuan to the dollar. He also reckoned that using the equilibrium balance of payments approach, the figure should be and somewhere between that and 5 yuan. He did his sums when the current account surplus to GDP ratio was higher. A recalculation today should push the figure towards or past the higher number. Using either method, however, implies the currency is still undervalued, if by an ever decreasing amount. Lipman notes, and the chart above shows, an important point: the central bank has managed the appreciation of the yuan by letting it rise steadily, an average of 6.4% a year since the peg was first broken. If that rate were to continue, the yuan would take until mid-2015 to reach five to the dollar and a further three years to reach four to the dollar, the range of Lipman’s computed equilibrium rate. By letting the exchange rate move only within a narrow daily band, China has managed to avoid the shock to its economy from a rapidly rising exchange rate that Japan endured after the Plaza Accord in 1985. Intended to end the undervaluation of the Japanese currency against those of its main trading partners, the accord led to the yen doubling against the dollar in two years (see chart above). That triggered the endaka recession and then the monetary expansion to counter it that inflated a property and debt bubble that was followed by Japan’s so-called Lost Decade. Those were lessons not lost on Beijing’s policymakers. One lesson that was lost on many Westerners, or at least has been widely forgotten, was that the forced rapid appreciation of the yen, did not eliminate America or Europe’s trade surpluses with Japan in the 1980s. They were caused by structural issues requiring different remedies. The same is true of China’s surpluses. Getting its currency in equilibrium is part of ending its own economic imbalances. As they apparently say in India, or at least in movies about India, everything will be all right in the end–and if it’s not all right, it is not yet the end. At the end of a fraught week for China-U.S. relations on the diplomatic front, state media aren’t letting the economic side of the relationship get away scot free. The People’s Daily says that the yuan is in equilibrium with the dollar, and may even be too high (here via Reuters). The article, from the Chinese Academy of Social Sciences, the leading think tank, follows U.S. Treasury Secretary Timothy Geithner saying during the strategic dialogue talks this week that the currency should move higher against the greenback to allow for more flexible policy. The yuan has risen by almost a third against the dollar since the peg between the two was broken in 2005. This is not the first time that Beijing has put forward the proposition that the yuan is now at a reasonable exchange rate against the dollar. Zhou Xiaochuan, governor of the People’s Bank of China, said as much earlier this week at a press conference during the talks, as did a Bank of China report in late March. None of that is likely to mollify American critics of China’s exchange-rate regime. Yet we are relieved, in one sense, to see the China-U.S. relationship returning to familiar ground. China Takes More Small Steps Towards Yuan Convertability. The widening of the daily band within which the yuan can trade against the U.S. dollar is another small step towards making the currency convertible. The timing of the announcement by the People’s Bank of China that the band will be widened to 1% from 0.5% was no accident. It came just ahead of the IMF and G-20 meetings in Washington, where Beijing is usually criticized for keeping its currency undervalued. Announcements intended to draw some of the sting from such criticisms is not uncommon on Beijing’s part. Yet nor should this latest one be unexpected. The current five-year plan sets expanding the use of the yuan in cross-border trade and investment as a goal, as it does the widening of the capital account, the two going hand-in-hand. The latest announcement also follows in increase in the quota of Chinese stocks and bonds foreign investors can buy, a raising of the ceiling on offshore yuan that can be invested domestically, and, as part of the Wenzhou experiment, the ability of Chinese investors to put excess savings abroad. The yuan has risen by almost a third since its hard peg to the dollar was broken in 2005 and by 8.3% since 2010 when a temporary peg imposed after the 2008 global financial crisis was removed. Prime Minister Wen Jiabao has recently talked of the currency nearing equilibrium with the dollar. Not all China’s trading partners agree, particularly China bashers in the U.S. who say that Beijing keeps its currency undervalued to protect its exporters. Reminder to protectionists: currency movements can be driven by investment as well as trade flows. If more investment moves offshore from China as a result of loosening currency controls, then the yuan may fall against the dollar, not rise as its critics clamor for. The new trading band gives it room to move either way in response to market demand. Criticism of China’s exchange-rate policy looks increasingly out of date. The battle is no longer only over exports. 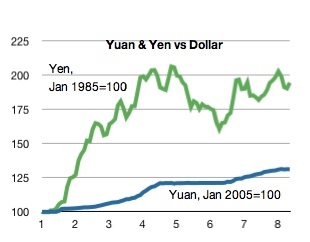 The longer war is over which currency will become the world’s dominant one, the dollar or the yuan. The yuan has to become fully convertible first. Though it still has a long way to go even to challenge the dollar let alone eclipse it, this latest round of currency-control loosening takes it another few steps down that path. Beijing will play its usual defense against the moves in the U.S. Senate to twist China’s arm to appreciate its currency against the dollar: vociferous denunciation of Washington for turning protectionist and initiating “trade wars” while patiently waiting out the start of any serious hostilities, calculating that the threat of them will eventually recede. The denunciation has duly come with Foreign Ministry spokesman, Ma Zhaoxu, saying the bill now in front of the U.S. Senate proposing punitive measures against any country that is shown to be manipulating its currency — for which read China — “seriously violates rules of the World Trade Organization and obstructs China-U.S. trade ties”. He told U.S. Senators to abandon protectionism and stop politicizing economic issues. He also told them to “stop pressuring China through domestic law-making”. Co-ordinated sentiments have been expressed by the central bank and the commerce ministry. While perhaps nobody outside the U.S. Congress really believes that a sharp revaluation of the yuan on its own will eradicate America’s trade deficit with China or create the new domestic jobs the U.S. is having such trouble generating, Beijing will know that even if the Democratic majority in the U.S. Senate passes the bill, the legislation will likely founder in the Republican controlled House of Representatives. Even if it does not, it is highly unlikely to survive a presidential veto. That is the past pattern of such proposed legislation. Support for this year’s bill appears to be stronger, helped by its narrower provisions and the background of sluggish U.S. growth and joblessness, but the odds remain long that it will become law. At the very worst from China’s point of view, and the bill does become law, it will be cheaper politically for Beijing to fight any punitive measures through the WTO than it would to be seen to capitulate to foreign pressure. Meanwhile, it can bide its time, letting the gradual appreciation of the yuan that has been underway since June last year (up 7% against the dollar since then and 10% against the euro) ease the U.S. pressure, which is anyway likely to abate after next year’s U.S. elections. Simultaneously, it buys more time for the economy, particularly the export-manufacturing sector, to adapt. China’s policymakers are quite happy for the yuan to appreciate. It will help them both fight inflation and restructure the economy. They just want do it to their timetable, not Washington’s–and they have the playbook to do that.